The Traits project allows you to simply add validation, initialization, delegation, notification and a graphical user interface to Python object attributes. In this tutorial we will explore the Traits toolset and learn how to dramatically reduce the amount of boilerplate code you write, do rapid GUI application development, and understand the ideas which underly other parts of the Enthought Tool Suite. Traits and the Enthought Tool Suite are open source projects licensed under a BSD-style license. 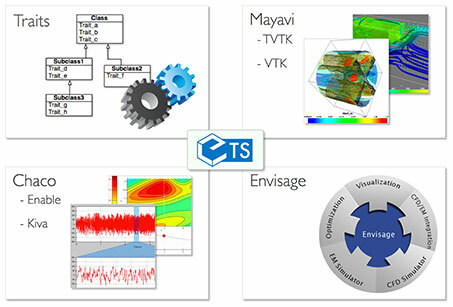 The Enthought Tool Suite enable the construction of sophisticated application frameworks for data analysis, 2D plotting and 3D visualization. These powerful, reusable components are released under liberal BSD-style licenses. Traits - component based approach to build our applications. Kiva - 2D primitives supporting path based rendering, affine transforms, alpha blending and more. Enable - object based 2D drawing canvas. Chaco - plotting toolkit for building complex interactive 2D plots. Mayavi - 3D visualization of scientific data based on VTK. In this tutorial, we will focus on Traits. is a coefficient of efficiency ranging from 0 to 1. Annual electric energy production depends on the available water supply. In some installations the water flow rate can vary by a factor of 10:1 over the course of a year. The data used in this tutorial are not real and might even not have sense in the reality. A number of other predefined trait type do exist : Array, Enum, Range, Event, Dict, List, Color, Set, Expression, Code, Callable, Type, Tuple, etc.
""" Complex initialisation of the reservoir name. """ 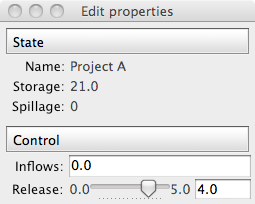 TraitError: The 'max_storage' trait of a Reservoir instance must be a float, but a value of '23' <type 'str'> was specified. TraitsUI simplifies the way user interfaces are created. Every trait on a HasTraits class has a default editor that will manage the way the trait is rendered to the screen (e.g. the Range trait is displayed as a slider, etc.). Being able to defer the definition of a trait and its value to another object is a powerful feature of Traits. """Keeps track of the reservoir state given the initial storage. hm3/timestep and not in m3/s. Heavy computation or long running computation might be a problem when accessing a property where the inputs have not changed. 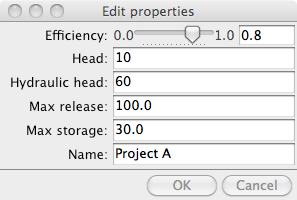 The @cached_property decorator can be used to cache the value and only recompute them once invalidated. Some use cases need the delegation mechanism to be broken by the user when setting the value of the trait. The PrototypeFrom trait implements this behaviour. Traits implements a Listener pattern. For each trait a list of static and dynamic listeners can be fed with callbacks. When the trait does change, all the listeners are called. To listen to all the changes on a HasTraits class, the magic _any_trait_changed method can be implemented. deleting the instance that holds the listener. The patterns supported by the on_trait_change method and decorator are powerful. The reader should look at the docstring of HasTraits.on_trait_change for the details. Trait listeners can be used to listen to changes in the content of the list to e.g. keep track of the total crop surface on linked to a given reservoir.